A chimpanzee is one of our closest living relatives. This means that they have some similar physical characteristics as humans. 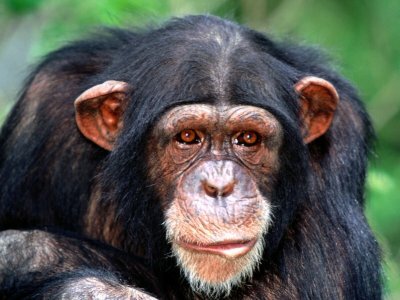 Although there are a variety of similarities between humans and chimpanzees, there are also many differences. Chimpanzees have a protruding face. Their jaws are larger and much more powerful compared to that of a human. This pushes their face out. A thick bone protects the eyes and extends above the relatively small braincase. Chimpanzees have powerful canines used for killing their prey and for fighting their rival chimpanzees. The brain of the chimpanzee has been measured at about 337 cc with a general range of between 282 and 500 cc. On the other hand, the human brain has been measured as being three times larger. A male chimp can stand up to 5.5 feet. It can weigh as much as 150 pounds. The female is a bit smaller. The common chimpanzee has long arms which, when extended, can span 1.5 times the body’s height. The arms are longer than legs. The bonobo chimpanzee is a bit shorter and thinner than the common chimp, but it has longer limbs. Chimpanzees usually walk on all fours and they cannot lock their knees. They must use their muscles whether they are standing or on all fours. Chimp toes are almost as long as their fingers and they have an opposable big toe for easier gripping. The animals have long fingers folded underneath when walking to stop the nails from getting blunt. The coat of a chimpanzee is dark. Their faces, fingers, palms and soles are all hairless. The exposed skin of the chimp’s face, hands, and feet varies from pink to very dark. However, this is generally lighter in younger chimpanzees and it gets darker as they get older.